For nerds with a zoobiological cast, there are few things more fun than speculative biology: the creation of fictitious life-forms upon extrapolation from what is known of reality. If nothing else, such speculation is a stimulating exercise when engaged in for its own sake (see "Hallelujah! Snaiad is Back" for several fine examples of this); but it takes on a decidedly silly cast when one attempts to formulate rationalizations for fictional organisms that were never intended to conform to the bounds of scientific plausibility. Godzilla, in particular, has been the focus of this sort of attention with respect to its physiology and phylogeny (Naish, 2010); although not so widely known outside of Japan, other kaiju have also received something resembling this treatment. Rather more humorous are the speculations I've seen on Elmo's morphoecology. 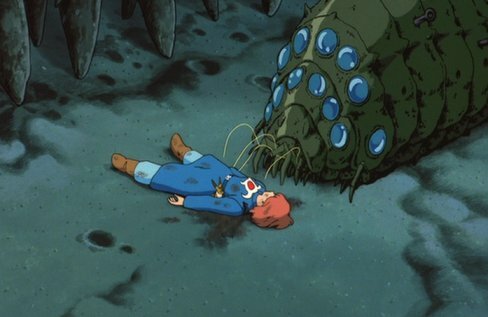 In this post, I will speculate on the anatomy and ecology of the Ohmu: outsized arthropods which appear in Hayao Miyazaki's film Nausicaä of the Valley of the Wind (1984) and its associated manga (serially released over the course of 1982-1994; Miyazaki, 2009). I regard the literary incarnation of this anime as that director's magnum opus, which, considering this animator's reputation, is saying a lot. Within this post, I will principally refer to the manga as my primary source (in the form of the English edition from Viz Media), since a) it contains considerably more material from which to gain an accurate picture of Ohmu morphology; b) I own a copy, whereas I have not been blessed with one of the film; and c) I am a geek. 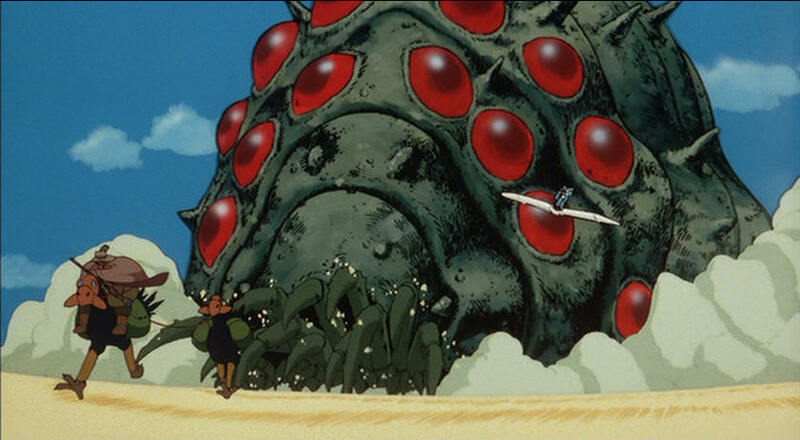 Irrespective of which iteration of Nausicaä of the Valley of the Wind one uses, the Ohmu are prominently featured. The mis-a-scené is a post-apocalyptic future (which I reckon at c. 3800 A.D.†) in which much of the terrestrial biosphere has been replaced by a sylvan biome stocked with gargantuan arthropods (of which the Ohmu are the most impressive) and characterized by pulmonary-toxin-emitting flora intertwined with a panoply of fungal symbionts (although there is some confusion as to which are botanical and which are fungal in classification; vol. 2, p. iii); termed a name translatable as "Toxic Jungle" or "Sea of Corruption", not only does its toxicity in and of itself displace all other ecosystems, but its spread is facilitated by the phoretic dispersal of spores via Ohmu (Miyazaki, 2012). But first an anatomical overview is in order. 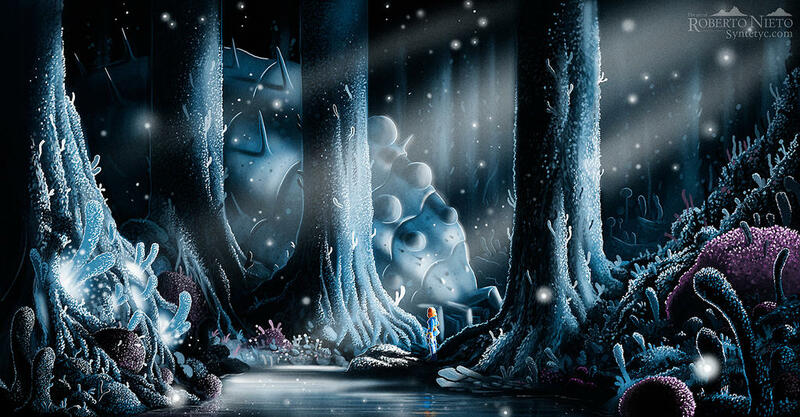 The Ohmu are clearly arthropodan in nature, what with their jointed appendages and chitinous exoskeleton; this is confirmed in both film and manga by the portrayal of exuviae‡, demonstrating that the creatures engage in ecdysis§ (Miyazaki, 2012) and is corroborated by the blue coloration of their blood (vol. 1, p. 207), which indicates that their circulatory metalloproteins are hemocyanins (as is typical of arthropods; Jaenicke et al., 2012). The trunk consists of a frontal prosoma consisting of four visible segments, the posterior two of which bear ommatidia: six on the anterior and eight on the posterior. The trunk's remainder (which we may term an opisthosoma) bears at least seven apparent tergites in the case of what is explicitly denoted as a juvenile (p. 202), with up to thirteen in mature individuals (p. 207). Even the smallest observed Ohmu in either film or manga reaches behemoth dimensions for an arthropod at a meter in length (p. 128). While not impossible—the largest extant terrestrial arthropod has a comparable leg-span (Drew et al., 2010) (if a lesser body mass)—this size is outlandishly dwarfed by adult Ohmu, which could conservatively be estimated at fifty meters in length (p. 126). Considering both this observation and the size disparity between these two age groups, we can deduce that Ohmu add new opisthosomal segments with growth: that is, their ontogeny can be classed as anamorphosis, which is observable in such unrelated arthropods as proturans and trilobites (Minelli et al., 2003; Fusco, 2005). Interestingly, the aforementioned juvenile individual appears later in the manga, significantly grown (yet still immature) and with an identical number of tergites (vol. 2, p. 225): this hints at a sort of inverse hemianamorphosis (Enghoff et al., 1993), with segment addition commencing after the first few instars. Intraspecific variation is also not impossible, if myriapods are any model (Fusco, 2005). Tangentially, it is worth noting here that the film version of Nausicaä of the Valley of the Wind reveals that ambulating Ohmu move via peristalsis: that is, they inch. This is not only atypical of arthropods (one Cambrian xenusian—a member of the clade Panarthropoda||—may have engaged in peristaltic movement; Vintaned et al., 2011), but is also mechanically peculiar, seeing as Ohmu do not burrow. The trunk's anterior is equipped with a suite of prolapsed, deflexed appendages, ambulatory much like those visible at the edge of each pleurite; their number is unclear, but I would venture a guess that there are at least six pairs in evidence. The number of legs per apparent segment is also obscure, but it can be pinned down as three pairs (vol. 2, p. 224): a count that is odd both in the numerical and usual senses. This can most readily be attributed to fusion of multiple segments in the Ohmu embryo, opening the possibility of decoupling in the number of ventrites relative to tergites, which occurs most famously in notostracans (Minelli & Fusco, 2004) but is widespread. We rarely get a good look at an Ohmu underside, but when we do, it appears that the trunk's ventrites neatly correspond to each opisthosomal tergite, whereas the prosoma possesses a single ventrite to its four tergites (pp. 133, 226). These views reveal additional anatomical strangeness in the form of a row of short locomotory appendages at the rear rim of each ventrite, running the trunk's breadth (Miyazaki, 2012). It is unclear if these are legs, but even if that is their identity I can think of no analogy among actual Arthropoda. There is a great deal of embryological funkiness going on here. Lastly, it would behoove us to consider Ohmu internal anatomy. Since Nausicaä is at one point protectively swallowed by a mature individual (vol. 2, p. 151), we are given a glimpse of a foregut with a papilla-covered lumen, but the creatures' viscera are otherwise ignored; this is unfortunate, since knowledge of the whys and wherefores of their respiration could help explain their implausibly humongous size. The most peculiar revealed aspect of an Ohmu interior would be the golden tendrils that can be everted from the anterior for manipulatory purposes, reaching up to a length equal to that of the prosoma (vol. 1, pp. 204, 207). Their number is, again, unclear (there are at least five pairs); but these appendages' greatest import lies in the fact that they are unsegmented. In an adult, said appendages are about four centimeters in diameter right down to their blunt tip—unlike most sensory extremities among the arthropods, these do not taper. Gripping capability is provided by an abrasive surface and transparent cuticular bullae (p. 110). These pasta-like tentacles are so bizarrely un-arthropodan that it is tempting to posit that their place in the Ohmu genome is derived from some organism completely outside that phylum; but I will imminently detail two ways in which their provenance could plausibly be arthropodan (Miyazaki, 2012). With that, it is at long last appropriate to speculate on the phylogenomic origins of the Ohmu. 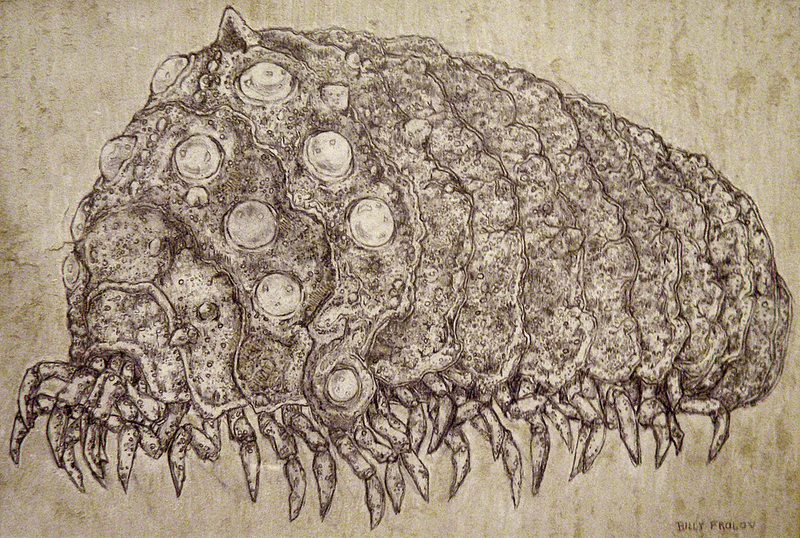 Their plumply sclerotized demeanor causes them to be often likened to pillbugs (Armadillidiidae) by fans, but this comparison breaks down immediately upon even the most cursory of examinations: compared to "roly-polies", Ohmu have far too many legs, simple—as opposed to compound—eyes, and are conspicuously lacking in antennae. Along with their apparently uniramous legs, this latter absence strongly indicates that Ohmu heritage has little of the Crustacea in it (if any at all); comparisons to trilobites are inaccurate for selfsame reasons (Hughes, 2003). 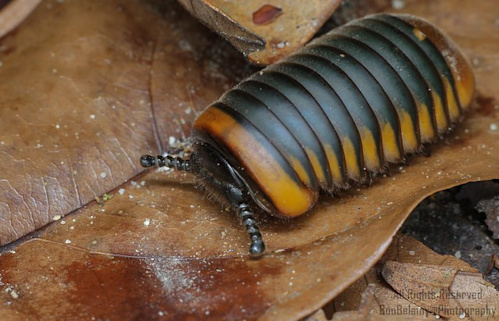 Their undifferentiated tagmosis and multitude of legs puts one more in mind of myriapods: specifically oniscomorphan millipedes, which have a number of apparent segments comparable to that of the Ohmu (Racheboeuf et al., 2004) and multiple leg pairs on each somite; but since Ohmu are presumably unable to protectively enroll (what with their prominent spines and ellipsoid outline), I venture that their closest topological and behavioral cousins among the Myriapoda would in fact be the glomeridesmidans (sole extant members of the superorder Limacomorpha), which are likewise incapable of volvation (Blanke & Wesener, 2014). Beyond pentazonian millipedes (constituted by the Oniscomorpha and Limacomorpha; Enghoff, 1990), Ohmu might also be comparable to the Merostomata: both by dint of their absent antennae and in a more superficial fashion by the prosoma/opisthosoma dichotomy introduced earlier. This taxon is of course now considered invalid (Schultz, 2007), at least in its traditional sense (Garwood & Dunlop, 2014), although the "merostomoid" mien of an Ohmu is undeniable. Nevertheless, the fact that the Ohmu prosoma is not fused into a cephalon sets them apart from the misnamed "sea scorpions" (Eurypterida) and their purported kin. Finally, we must jury-rig a hypothesis as to the genetic derivation of the Ohmu sensory tendrils. As they are unsegmented, it is tempting to deny that their transgenic origin lies among the Arthropoda; but two alternative possibilities occur to me: first, that the twining appendages are an atavism, homologous with lobopodians'¶ extremities; second, that they represent extensions of a labrum. The former of these two postulates proceeds from a recognition that "arthropodization" (the acquisition of exoskeletal joints on ancestrally unsegmented limbs) occurred in at least two lineages within the Panarthropoda (Ma et al., 2013), and moreover that said clade covers a variable morphological continuum from the completely articulated arthropods themselves to taxa that are not armored in any way, shape or form (Edgecombe, 2009), suggesting that the presence or absence of jointed limbs has some evolutionary plasticity (note also that some analyses situate the lobopodian Onychophora within the Arthropoda; Koenemann et al., 2010): the Ohmu might have secondarily lost segmentation in their manipulatory appendages, which in this scenario are homologous with one or several pairs of cephalic appendages in other arthropods—albeit multiplied a number of times that is beyond belief. But these tendrils' lack of segmentation also brings to mind the labrum, a lobe situated anterior to the mouth in hexapods, crustaceans and other taxa (Racheboeuf et al., 2008; Posnien et al., 2009) that acts as an "upper lip" in feeding. Whether or not this appendage is a muscular extension of the head, or a modified trunk appendage (as are all other cephalic limbs in the Arthropoda) is a matter of ongoing embryological debate, but this contention is immaterial to its posited presence on the Ohmu head. 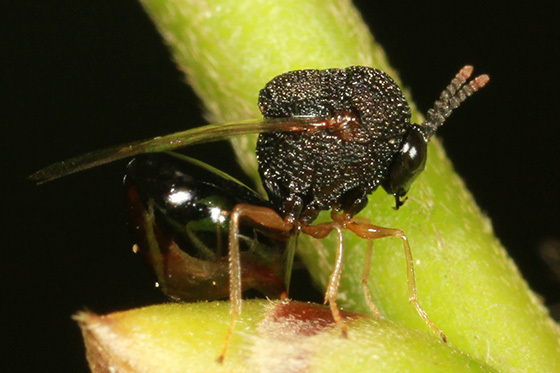 That titanic pseudo-arthrosphaerid's labrum under this hypothesis would be digitate after the fashion of perilampid and eucharitid wasps (Darling, 1988), but exaggerated to an unparalleled degree. As an appendix to this discussion, I should bring up what can be inferred from our primary sources regarding Ohmu ecology and behavior. We are granted little information as to the latter, other than that the creatures are sentient and engage in some degree of brood care (given their behavior in vol. 1); reproduction is completely ignored, although if they resemble the majority of arthropods, Ohmu are both dioecious and viviparous. Diet is at least partly fungivorous (vol. 2, p. iii). The ommatidia turn from the usual azure to crimson when an individual is angered: I know of no biochemical mechanism that would enable this, and it must be regarded as narrative license, humanizing a species that has nothing in the way of anthropomorphism. Their ecological role as a keystone organism in the Sea of Corruption is fleshed out to a much more pronounced degree: zoochory of the Sea's flora via these arthropods (vol. 2, p. 143) is essential to its spread, and fungal and botanical growth will sprout outright on the surface of aged or dying individuals (p. 181). Epizoic associations of suchlike intimacy seldom occur in arthropods, but have been documented on weevil species (Gradstein et al., 1984), a harvestman (Machado & Vidal, 2002), and a millipede (Martínez-Torres et al., 2011); the latter exemplar supports 10 separate species of bryophytes classified in half that many families. Although commensal cuticular mosaics consisting of fungi in the likeness of those observed on the Ohmu—as opposed to bryophytes—have never been reported on arthropods (to my knowledge), epizoic communities of this sort are far from inconceivable. In sum total, the only impossibility of Miyazaki's conception of the Ohmu is physiological: namely, their aforementioned gigantism. The largest known terrestrial arthropod in geological history was merely two meters in length, and only permitted to evolve such colossal dimensions by dint of the atmosphere it inhabited (14% more oxygenated than our contemporary air; Beerling, 2007): while the hydrosphere in Nausicaä's era is laden with pollutants, it is uncertain what residual effects humanity's ecological ruination has had upon atmospheric composition. Using Occam's Razor (or at least so I think), I propose that it is most likely that Ohmu respiration and circulation was genetically modified to facilitate their size. ...And now that we have exhausted the possibilities for intelligent discussion of the Ohmu, I consider this post finished. *A clade consisting of the Abelisauroidea and Ceratosauridae (Pol & Rauhut, 2012). †A ballpark estimate that remains in the realm of fanon, based upon the prologue's statement that industrial civilization collapsed roughly a millennium after its beginning, and that the story is set a millennium after that (Miyazaki, 2012); this is summed, of course, with a dating of the Industrial Revolution as commencing c. 1800 A.D.
||The most inclusive group constituting the common ancestor of the phyla Arthropoda, Onychophora, and Tardigrada and all its descendants. 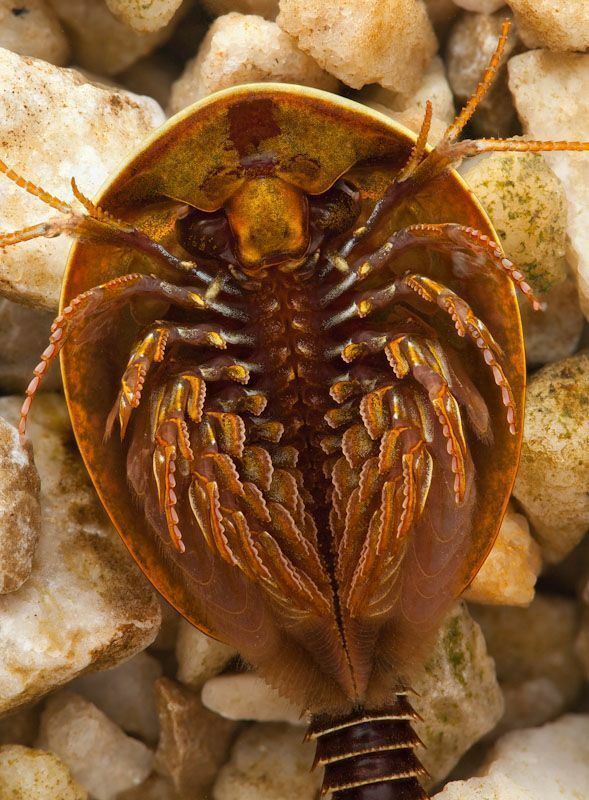 ¶A morphological grade referring to primitive panarthropods too basal to lie within any of that clade's extant phyla. Beerling, D. (2007). The Emerald Planet: How Plants Changed Earth's History. Oxford: Oxford University Press. Carpenter, K. (1998). A dinosaur paleontologist's view of Godzilla. In Lees, J. D. and Cerasini, M. (eds. ): The Official Godzilla Compendium (pp. 102-106). New York: Random House. Enghoff, H. (1990). The ground plan of millipedes (external morphology). In Minelli, A. (ed. ): Proceedings of the 7th International Congress of Myriapodology (pp. 1-22). Leiden: E. J. Brill. Enghoff, H.; Dohle, W.; and Blower, J. G. (1993). 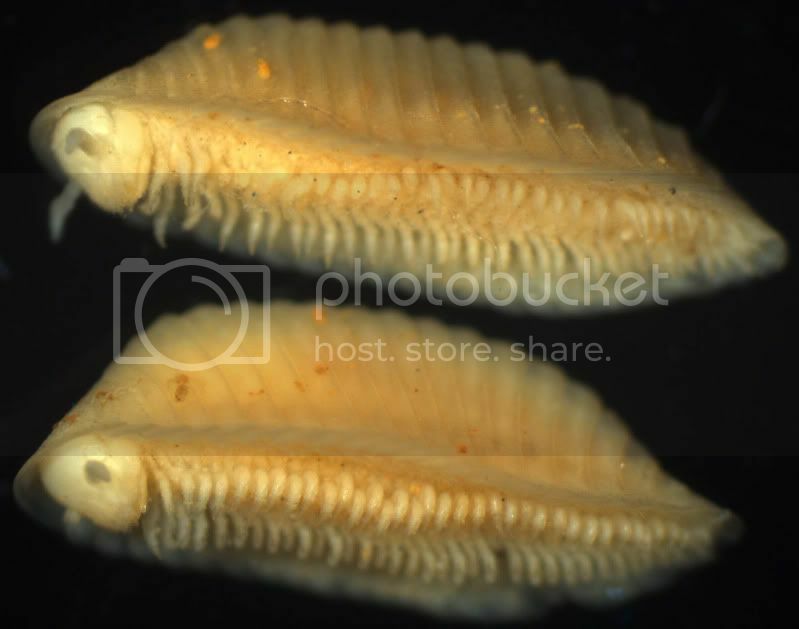 Anamorphosis in millipedes (Diplopoda)—the present state of knowledge and phylogenetic considerations. Zoological Journal of the Linnaean Society, 109, 103-234. Gradstein, S. R.; Vitt, D. H.; and Anderson, R. S. (1984). The epizoic occurrence of Daltonia angustifolia (Musci) in Papua New Guinea. Cryptogamie: Bryologie et Lichénologie, 5, 47-50. Minelli, A. and Fusco, G. (2004). Evo-devo perspectives on segmentation: model organisms, and beyond. TREE, 19, 423-429. Miyazaki, H. (2009). Starting Point: 1976-1996 (vol. 1). San Francisco: Viz Media. Miyazaki, H. (2012). 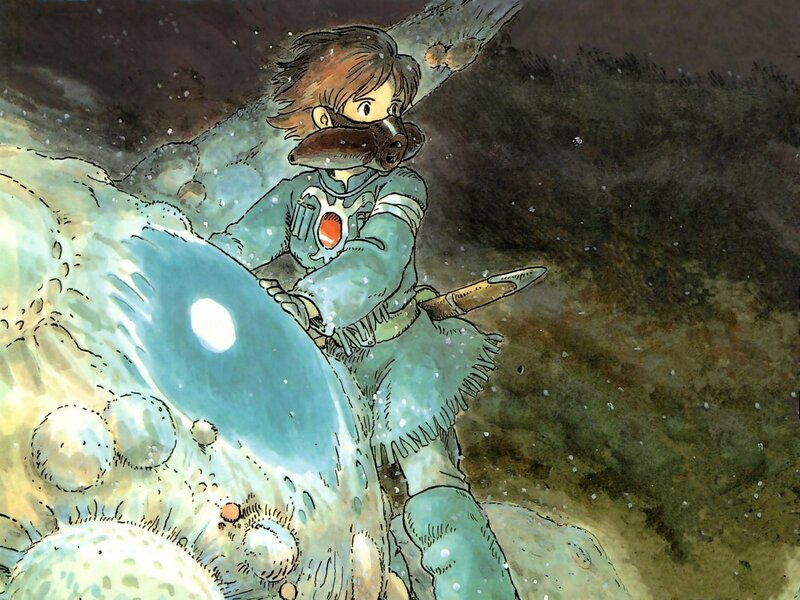 Nausicaä of the Valley of the Wind. San Francisco: Viz Media.